Using the Import File command allows you to select multiple files simultaneously, but only if they reside in the same folder. Using this command is a little troublesome if you need to import files that reside in different folders on your hard drive. To address this problem, After Effects uses a command called Import Multiple Files. 1 Choose File > Import > Multiple Files to open the Import Multiple Files dialog box. You can also use the keyboard shortcut Command+Option+I (Mac OS) or Ctrl+Alt+I (Windows) or right-click in any empty area of the Project panel and choose Import > Import Multiple Files. 2 Navigate to the images folder; press and hold down the Ctrl (Windows) or Command (Mac OS) key on your keyboard, and click on fountain.jpg and Washington Church.jpg to select them both. Click the Open button to import them. The files are imported and the Import Multiple Files dialog box opens again to allow you to select additional files. 3 Navigate to the audio folder and click on Subliminal.mp3 to highlight it. Click Open to import this file as well. 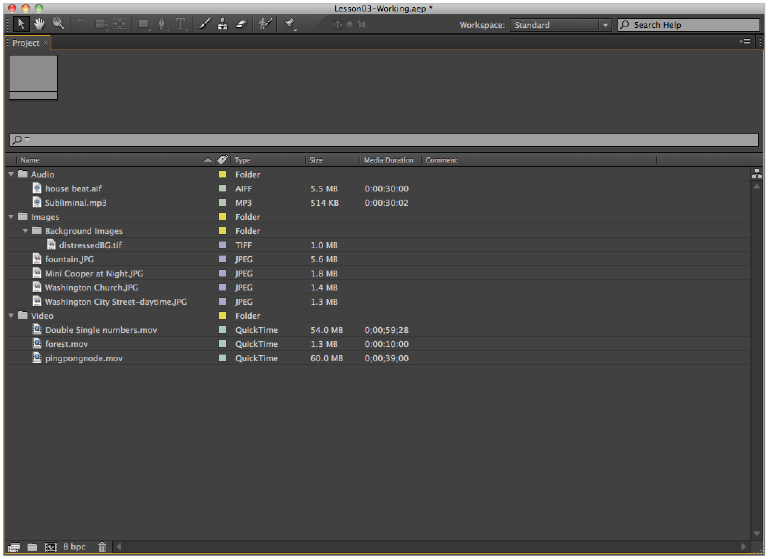 Again, After Effects imports the file and the dialog box reopens. 4 Navigate to the video folder, hold down the Command (Mac OS) or Ctrl (Windows) key on your keyboard, and click on forest.mov and pingpongnode.mov to select them both. Click Open to import these files. Again, the dialog box opens. 5 Click Done to close the dialog box, as you no longer need it. The Project panel now shows that all the files that you imported have been added to your project. panel. When you import multiple files, they all appear highlighted. 6 With the Project panel highlighted, press the tilde key on your keyboard to maximize it to full-screen size. 7 Move the video files (forest.mov and pingpongnode.mov) into the Video folder. 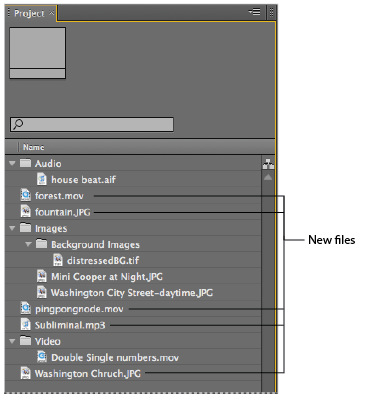 Move the audio file (Subliminal.mp3) into the Audio folder, and move the image files (fountain.jpg and Washington Church.jpg) into the Images folder. Your Project panel should now match the figure below. With the Project panel highlighted, press the tilde (~) key on your keyboard to minimize the panel and return to the Standard workspace layout. Enlarge the Project panel, then organize your files for easier access. 8 Save your file by choosing File > Save or by pressing Ctrl+S (Windows) or Command+S (Mac OS) on the keyboard. Do not close this file, you will need it in the next part of the lesson.